We have already had some really great events this year at Battle Creek Elementary School, and we would love to see all of the great photos that have been taken at those events… and possibly add some of those photos to the yearbook for 2017-18! If you have any questions or would like to volunteer for the yearbook, please let us know in your e-mail! There will be a display in the school office with snowflake tags. Snowflakes will be anonymous, but will state a child’s age, gender, and the items they need or want for the holidays. Families who choose to participate will take a snowflake and shop for the child, and then return the wrapped gift by Friday, December 8. It can be a wonderful experience to shop for another person with your child. This is a great opportunity to talk with your child about empathy, kindness, and generosity! If you would like to participate, please stop by Battle Creek Elementary between the dates of November 20th and December 1st to pick up a snowflake (or snowflakes). You will then need to bring your wrapped gift back to Battle Creek Elementary by Friday, December 8 (please attach the snowflake to the wrapped gift with Scotch tape to help us keep track of the gifts/recipients; it would also be very helpful to write on the snowflake what is in each package). If purchasing multiple gifts for a student, please group them together in one bag. First Parent Club Meeting of the 2017-18 Academic Year is Tonight! Just a quick reminder that the first Battle Creek Parent Club meeting of 2017-18 will be held tonight in the Library at Battle Creek Elementary School, from 6:30–7:30pm. Childcare will be provided for those who attend. 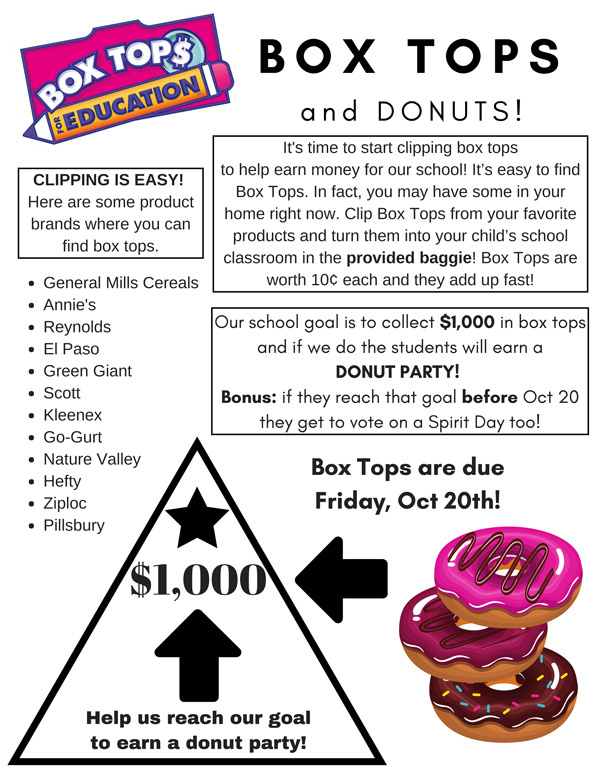 The Battle Creek Parent Club has participated in the Box Tops for Education program for the past 2 years, since the 2015-16 school year… and we have raised nearly $3,000 through this fundraising program in those 2 years. You can help us meet (and exceed) our annual goal in 2017-18! Back-to-School Night is Tuesday September 5! Back-to-School night will be held on Tuesday, September 5 (4:00–5:30pm) at Battle Creek Elementary. Make plans to bring your student to school during this time… find out teacher and classroom assignments… drop-off school supplies… meet teachers… and get connected to BCE’s parent club! We need a few volunteers to help out at the Parent Club table in front of the school! We are asking only for help during a few different 20 minute shifts (so easy! )… so please sign up if you are available for 20 minutes while you’re at the school that night. SIGN UP USING THIS LINK. Meanwhile, mark your calendar — the first official Parent Club meeting of the 2017-18 school year will be held on Wednesday, September 20. We’d love to have you come join us, get involved, and help make your student’s upcoming school year the best ever! The final parent club meeting of the 2016-17 school year will be held tonight — Wednesday, June 7 at 6:30pm in the Library at Battle Creek Elementary. As always, childcare will be provided for those who attend. Please come and see what’s going on as we wrap up this school year, and begin planning for the coming year! *PLEASE NOTE* sign-ups are now available for next week’s Field Day at BCE! Come and help run a station and see your child have a blast with their classmates! You can sign-up to help by clicking HERE. We will be posting a sign-ups soon to get parent volunteers to help out with Field Day (keep an eye out for that… & sign-up for our newsletter HERE if you don’t already receive it). This has been an amazing school year! Thank you parents, for all you do! The May 2017 parent club meeting will be held tonight — Wednesday, May 10 at 6:30pm in the Library at Battle Creek Elementary. As always, childcare will be provided for those who attend. Come join us and learn how you can support your favorite BCE students! As you have likely heard, this coming week is Teacher Appreciation Week! We invite your students to draw a picture or write a letter for their teacher (possibly themed with “why they are a superhero”) to bring to the teachers on Thursday 5/4. Additionally, on Friday 5/5 we encourage the children to bring a favorite treat for their superhero teachers! Meanwhile, not only is it Teacher Appreciation Week throughout the upcoming week… it is also time for the Spring 2017 Book Fair! We are in need of some volunteers to help us run the Book Fair! If you are able to come in and help anytime throughout this week, please sign-up HERE (there are plenty of different times of day to come help for a bit… and we thank you in advance for helping!). The next BCE Parent Club meeting will be held on Wednesday 4/12 in the library at Battle Creek Elementary, at 6:30pm. As always, child care will be provided. If you have an interest in helping our students and school have an amazing 2017-18 school year, this month’s meeting is for you! As we approach the end of the 2016-17 school year, we will have several newly-available positions on the board and we are hoping to get them filled in advance at this month’s meeting!